Scythe have made some uniquely shaped coolers in the past but perhaps not as strange as some of Zalman's designs. This cooler has a V shape to it with the inner parts of that V being extended up until they touch the cooling fan and to give a bit more surface area for heat to dissipate to. That could have made the cooler much shorter than other heatsinks if it wasn't for the height of the heatpipes beneath the actual heatsink. That does give you a lot of clearance for RAM with tall heatspreaders, something many other coolers do not offer. Check out [H]ard|OCP's review to see if the cooler is as quiet and effective as the advertising claims. 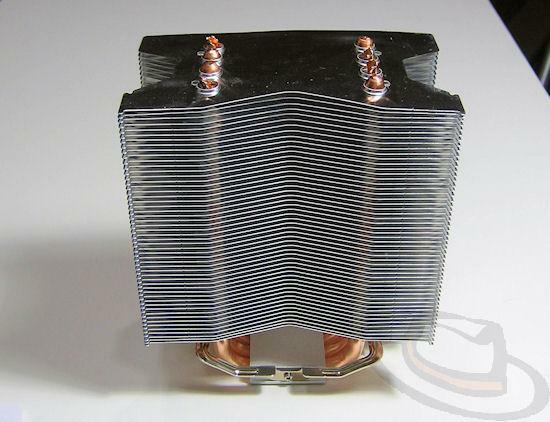 "Many times in the world of CPU cooling, heatsinks look much the same from one to the next. The Grand Kama Cross 2 caught our eye due to its very unique design and we wanted to see if there was more to it than just aesthetics. The design is somewhat reminiscent of V type engine, but let's see if it has any horsepower to back it up." This design look like it is easier to get at the memory on the motherboard or will avoid motherboard heat sinks. I would consider buying this if everthing I had wasn't water cooled. It shares many of the design flaws of the sunbeam core contact cooler. I purchased one a while back and noticed some poor cooling, I was able to drop temperatures by about 10+ c by simply taping the top of the fan and the bottom of the fan to the to the top and bottom of the heatsink (because the center of the heatsink makes a V shape, when the fan is running you can feel a strong wind from the top and bottom gap. The next area where it had a strong wind, was in the sides of the cooler, since the heatsink makes almost like a butterfly shape, much of the wind escaped through the sides. By making a box using tape to essentially form a duct around the sides of the heatsink, significantly improved the performance. Air always flows to where there is the least amount of resistance, so if you create a gap of free space between the heatsink and the fan, then most of the air will flow through that gap instead of going through the heatsink fins. this is all made even worst when using heat popes to transfer heat. Heat pipes can transfer heat a longer distance than a sheet of aluminum, but they transmit hat slower. They help to more effectively use the full surface area of a heatsink (since without heat pipes, a large heatsink will mostly have a hot spot close to the CPU, but when you rely only on heat pipes, then you get reduced cooling. This is why sealed liquid coolers can offer lower temperatures with less surface area. liquid transfers heat much better than a heat pipe. radiators and heatsinks also have a exponential cooling curve, eg if the heatsink is at 200C, it can go from 200C to 100C many times faster than going from 100C to 50C, the larger the delta between the ambient temperature and the heatsink or radiator temperature, the faster the cooling. Being able to rapidly circulate a liquid through the system allows it to take advantage of the faster parts of the cooling curve, and thus less surface area providing more cooling. For air coolers, they need to go back to the design of having some or all of the fins connected directly to the cooling base, and also heat pipes coming off the base to bring additional heat out to the outer fins to maximize the use of the cooling fins.